Central nervous system (CNS) involvement can be an isolated recurrence or as a part of the progressive systemic disease in secondary CNS lymphoma (SCNSL). SCNL is typically a non-Hodgkin's type of lymphoma, and unlike primary CNS lymphoma, more commonly involves the leptomeninges. 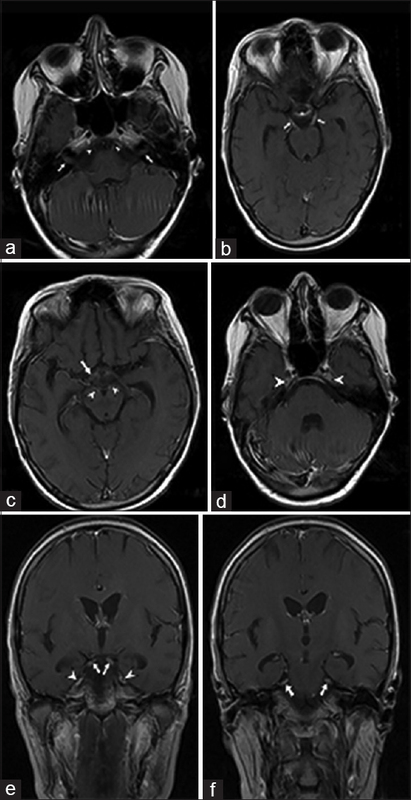 In this report, we present the rare case of secondary CNS involvement from thyroid lymphoma in the form of multiple cranial nerve involvement. A 26-year old lady presented to the emergency department with acute onset of right facial weakness, blurred vision, dysphagia and bilateral ptosis. She had noticed a gradually enlarging neck mass and upper limb weakness for the past five months. On the initial examination, she was pale with a huge anterior neck mass. Neurologic examination demonstrated bilateral ptosis, sluggish response of the pupils to light, right facial paralysis, and paralysis of multiple extra-ocular muscles. The gag reflex was also impaired. There were no signs of meningeal irritation. Cervical magnetic resonance imaging (MRI) examination revealed a huge thyroid mass and an epidural mass in the cervical spinal canal with cord compression [Figure 1]. On brain MRI examination, homogenous enhancement of multiple hypertrophic cranial nerves was noted [Figure 2]. Cytological examination of the cerebrospinal fluid (CSF) revealed lymphoma cells in the CSF specimen. The thyroid mass was resected and the cervical thecal sac was decompressed. The histopathological analysis confirmed the diagnosis of large B-cell lymphoma. Chemotherapy was administered after debulking the tumor; however, the patient succumbed to her illness. The clinical presentations of SCNSL include new onset headache, cranial nerve palsy, mental alteration, coma and seizure. Assuming a neoplastic source for the CNS symptoms in our patient, we ordered contrast enhanced MRI. Although the most common imaging presentations of SCNSL include superficial or periventricular enhancing masses or meningeal enhancement,,, our patient presented with multiple cranial nerve enhancement, which is not a common imaging finding. This uncommon radiological presentation can be seen in infectious or neoplastic causes (in metastasis or lymphoma), or in association with a demyelination process., Hypertrophy of cranial nerves is an important clue that favors the neoplastic nature of the disease. Isolated enhancement of multiple cranial nerves without meningeal enhancement is an extremely unusual finding in CNS lymphoma and its exact etiology is yet to be elucidated. We could only find two other cases of isolated cranial nerve enhancement secondary to CNS lymphoma in the literature., Although the patient did not consent for nerve biopsy, the presence of primary thyroid lymphoma and the presence of lymphoma cells in the CSF supported the diagnosis of secondary brain lymphoma as the cause of multiple cranial nerve enhancement in this case. Manoj N, Arivazhagan A, Mahadevan A, Bhat DI, Arvinda HR, Devi BI, et al. Central nervous system lymphoma: Patterns of incidence in Indian population and effect of steroids on stereotactic biopsy yield. Neurol India 2014;62:19-25. MacKintosh FR, Colby TV, Podolsky WJ, Burke JS, Hoppe RT, Rosenfelt FP, et al. Central nervous system involvement in non-Hodgkin's lymphoma: An analysis of 105 cases. Cancer 1982;49:586-95. DeRosa P, Cappuzzo JM, Sherman JH. Isolated recurrence of secondary CNS lymphoma: Case report and literature review. J Neurol Surg Rep 2014;75:e154-9. Kaku MV, Savardekar AR, Muthane Y, Arivazhagan A, Rao MB. Primary central nervous system dural-based anaplastic large cell lymphoma: Diagnostic considerations, prognostic factors, and treatment modalities. Neurol India 2017;65:402-5. Patel B, Chacko G, Nair S, Anandan J, Chacko AG, Rajshekhar V, Turel M. Clinicopathological correlates of primary central nervous system lymphoma: Experience from a tertiary care center in South India. Neurol India 2015;63:77-82. Sakai K, Hamaguchi T, Yamada M. Multiple cranial nerve enhancement on MRI in primary Sjogren's syndrome. Intern Med 2010;49:857-9. Salunke P, Gupta K, Singla N, Singh H, Singh P, Mukherjee KK. Meningeal tuberculoma mimicking chloroma in a patient with chronic myeloid leukemia on imatinib. Neurol India 2011;59:628-30. Khadilkar SV, Bhutada AG, Chaudhari CR, Velho V, Domkundwar S, Muzumdar G. Hypertrophic multiple cranial neuropathies: An unusual presentation of primary CNS lymphoma. Ann Indian Acad Neurol. 2015;18:74-6. Tajima Y, Tashiro J, Miyagishi R, Matsumoto A. A case of malignant lymphoma exhibiting multiple cranial nerve enhancement: Leptomeningeal metastasis? Or another lymphoma associated event? J Neurol Neurosurg Psychiatry 2001;70:565-6.